UPS just dropped of a little present from mazworx. 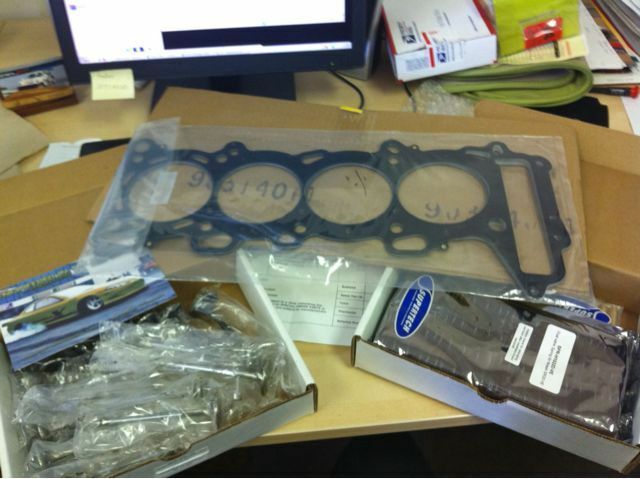 Got all my sr20ve head parts so I can drop the head off for machining and rebuild. Going 1mm oversized intake valves and 2mm oversized inconel exhaust valves. This with the ve head on the det block should make good power. Of course a headgasket machined for 1/2″ head studs and supertech dual valve springs and bronze valve guides to make sure the head is good to 9k rpms. Still waiting for engine bearings on back order but at least now I can drop the head off for machine work! ~ by B. Rogers on July 22, 2010.